Discussion in 'Components, Accessories and Clothing' started by mrfacetious, 7 Apr 2010. Markham. South Wales Valleys, boyo! Hi all. Does anybody have experience using either or both types of dynamo who could compare them for me? I was initially attracted to the more efficient hub dynamo but there's not way I'm retrueing, tensioning or lacing my own wheel, my LBS is full of bandits who'd charge me so much I might as well buy a lifetime supply of replacement batteries and hellfords would probably do a worse job than I would. ^^^ £48.99 from SJS. Also the modern bottle has "neglibly more rolling resistance" than a hub (apparently) and, obviously, can be "switched off" so to speak. Can anybody offer me any more than the printed word of the salesman? Thanks. I have bottle dynamos on a few of my bikes. A Nordlicht 2000 (replacing an earlier Basta Duo which I broke, long story) on my Pug, an old Sourbitez on my Carlton and very old Unions on my Twenty and shopping bike. They work well imo and it's true that the new Nordlicht does have less drag than the older ones but the older dynamos work very well too. The Basta Duo was pretty good as well apart from the fact that the connectors tended to come out over bumps. I don't believe there is any really noticeable rolling resistance. There is some noise which tends to make you think there is but watching the speed on the cycle computer, I might drop maybe 1mph on a hill when the dynamo is on the tyre compared to the speed I would achieve without so I don't consider it a big deal. I have never had any problems with slipping while riding in the rain. The most important thing is to align it correctly. Use a straight edge or tie a piece of string around the axle and pulled tight to make sure that an imaginary line drawn through the axis of the dynamo passes through the centre of the axle. This is important to reduce drag, noise and tyre wear. Also, adjust the pressure against the tyre so that it exerts no more than is necessary to turn the dynamo. If you find it does slip in the wet, you can always increase the pressure a little at a time. Look carefully at your tyre. Some have a track on them for a dynamo. If so, ensure that the dynamo runs on it. 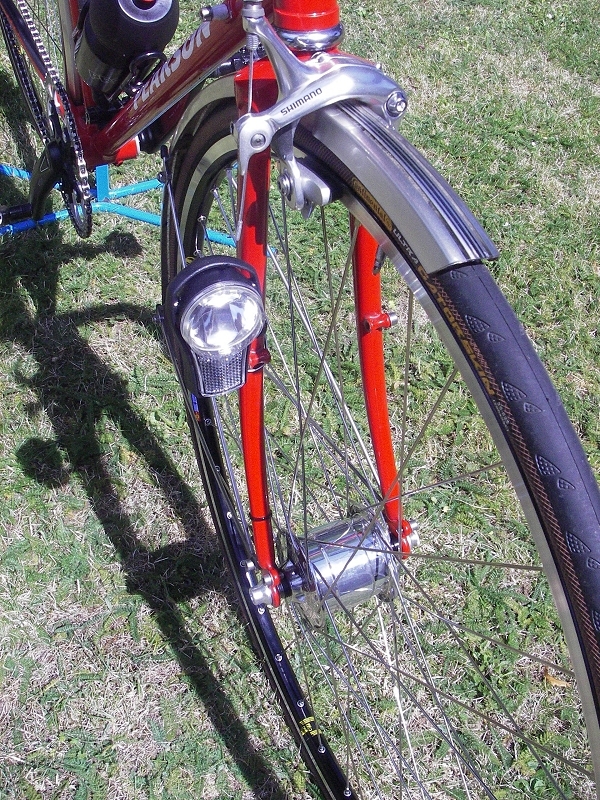 Also, when connecting a bottle dynamo, most are designed to earth through the frame of the bike. I would recommend to use two wires and don't use the frame as an earth. Speaker wire, available cheaply from any hi-fi or car accessory shop is excellent for wiring dynamo lights. To make it work properly through the frame means scraping paint and causing rust on the frame and ultimately a bad connection and dim lamps. The only hub dynamo I have experience of is a Sturmey Archer AG of 1951 vintage. It is totally silent, no noticeable drag but it is only 2w output instead of 3w like a modern dynamo. The light also tends to flicker at very low speeds due to the low rotational speed of the hub inside a huge 28" wheel generating low frequency AC. It is also ridiculously heavy but does include three gears. I would expect a modern dynohub to be much better. I have never got on with hub dynamos, although at least half the trouble was with the lamps. If you get a bulge in your tyre they cause the light to flicker. They can wear your tyre pretty badly. My other complaints with dynamo light systems I've had in the past were more due to the lamps. They stopped shining when you stopped pedaling obviously, but the bulbs tended to blow quite often. You also have to be careful to earth them properly, especially the rear one. I shelled out quite a lot of money for a Schmidt SON XS dynamo hub for my Brompton. It was a waste of money really, but I wanted one. It certainly shines out good light, it's reliable, and there's not much drag. It took quite a lot of time, money and faffing about to find an adequate lighting configuration though. You can either get lights with standlights or else back up with a cheapish LED light back and front to cure the problem with lights going out when stationery. These have low power needs and batteries will last them quite a while and you have your bright dynamo lamps when moving. Mrs Mickle has a SON on her Thorn tandem. It illuminates the night sky over York with no noise and no noticeable drag. The Slightly Deranged German who builds our wheels conceded recently that the top Shi**no versions are now 'just as good'. Strong praise indeed coming from him. I haven't had all too much experience with hubs so can only recommend that you purchase a bottle hub only if you have larger wheels (26"+.) Smaller wheels will wear quicker and the resistance is noticable apparently. Finally, if buy a subdued looking bottle nose, unnecessary attention is not welcome. I have always used hub dynamo generators, thirty years ago that was Sturmey Archer, now I use a Schmidt as at the time they were in my opinion better than Shimano, although the latter have now caught up in many ways. I always preferred the hub type as they didn’t slip in the wet (arguably when you need it the most) and didn’t wear the tyre out, I also find them much more durable. My cuttent set up is also very bright, although in fairness so would be a bottle generator so that was not really a consideration when chosing one over the other. Although bottle generators are now much better than they once were; so are hub generators, I would still chose them over the bottle type every time; as far as I am concerned the reasons I chose them back then are the same reasons I would still chose one now. I have never got on with hub dynamos, although at least half the trouble was with the lamps. If you get a bulge in your tyre they cause the light to flicker. They can wear your tyre pretty badly. I think the above is aimed at bottle dynamos rather than hub systems. My other complaints with dynamo light systems I've had in the past were more due to the lamps. They stopped shining when you stopped pedaling obviously, but the bulbs tended to blow quite often. You also have to be careful to earth them properly, especially the rear one. This doesn't really hold up with modern kit. A nice dynamo light (eg B&M mid range and up) will include a standlight function to keep the light shining for a few minutes after you've stopped moving (let alone pedalling). I recall blowing plenty of filament bulbs with a bottle dynamo, but the contemporary B&M and Schmidt stuff all cuts the excess long before it'll mess with the lights. I've used SON hub dynamos extensively (9k miles last year) paired with B&M LED lights front and rear and have found the whole thing very much pain free. I've now moved to a Shimano dynamo hub and, at least until I write this, has been no hassle at all - only issue I've had was the first ride after the first time I washed it and I'd put the connector on back-to-front. It also has far less rolling resistance than the bottle dynamo - so much so I now use daytime 'running lights'. I use it with a B&M Lumotec Cyo IQ Senso with Standlight (very bright) and a B&M standlight rear. A decent bottle dynamo is 40% efficient; a good hub dynamo is 60% efficient. So for a 3W bulb light, a bottle will make you put in an extra 7.5W of pedalling power and a hub will cost an extra 5W. Modern LED lights will draw more power than this (about 7W from a hub dynamo at 30kph). There have been bottle dynamos that are as efficient as a hub (B+M S6, Lightspin), but they cost just as much as a good hub, had reliability problems, and still had the normal problem with slipping in the wet. Consequently they aren't made any more. I never found that to be the case with my Lightspin. And I bought two of the last of them at a vastly reduced price . But if I was starting again, I'd probably go for a hub dynamo, purely because it's a neater solution and is one less thing to find space for. Correct, I did mean bottle dynamo. I have B&M lights on my Brommie. They work pretty well, but I did not find it a pain free exercise selecting the right lamps. First I bought one of the oval B&M front lamps, only to find it wouldn't fit under my front pannier (which is not a consideration for most bikes). Then I got a circular B&M front lamp with a stand light, but the stand light was so dim, it was barely worth bothering with. Now I just have a basic, circular B&M front lamp with no standlight. I also have a flashing LED on the front for traffic lights and other enforced stops. I also had big problems with the rear light. I eventually decided on a 3 mode B&M rear lamp. The modes are 1) shine when the bike's moving, 2) shine all the time as if battery powered, and 3) shine while moving and for several minutes after stopping. The main problems I have with it are remembering which switch setting is which, and people telling me I've left my lights on after folding the Brommie up. I think a hub dynamo is good for audax bikes, tourers, or commuters where you're travelling down country lanes at night. In which case a dual lamp set up is probably best. You don't really need them for the rear lamp as an LED will do the job at least as well. If you do have a dynamo powered front lamp, you should probably also have a front LED as well for traffic lights. I spent £7.50 on a Basta bottle dynamo and it has been working fine for the last 3 years commuting in all weathers. It has knurled metal roller. I have never noticed it slipping and there is no visible wear on the sidewall of my Schwalbe Marathon Plus tyre, which has a special dynamo running track moulded into it. I would say the dynamo itself is quite light, but the cheapo metal bracket is heavy. The dynamo makes an audible buzz, which is sometimes annoying but is very good for scattering pedestrians . I have B&M lights on my Brommie. They work pretty well, but I did not find it a pain free exercise selecting the right lamps. [...] The main problems I have with it are remembering which switch setting is which, and people telling me I've left my lights on after folding the Brommie up. I hear you there. Bromptons and recumbents have similarities in oddity of mounting points, unusual wheel sizes, unlikely clearances and tricky cable runs. I reckon I maybe got lucky with the B&M CYO front. LED powered, *very* bright, and (with a little jiggery pokery) easy to attach.